Disturbances of brain derived neurotrophic factor (BDNF) signaling, which may occur among those with a polymorphism of the Val66Met gene, comprising a Met substitution for the Val allele, may be associated with depressive cognitions. However, presumed elevated BDNF levels among individuals with the Val/Val genotype, might confer increased responsivity to contextual challenges, thus fostering vulnerability to depression. In Study 1, among undergraduate students (N = 252), increased loneliness perceptions were accompanied with depressive symptoms. 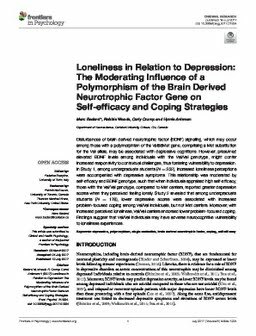 This relationship was moderated by self-efficacy and BDNF genotype, such that when individuals appraised high self-efficacy, those with the Val/Val genotype, compared to Met carriers, reported greater depression scores when they perceived feeling lonely. Study 2 revealed that among undergraduate students (N = 178), lower depressive scores were associated with increased problem-focused coping among Val/Val individuals, but not Met carriers. Moreover, with increased perceived loneliness, Val/Val carriers endorsed lower problem-focused coping. Findings suggest that Val/Val individuals may have adverse neurocognitive vulnerability to loneliness experiences.